This product does not qualify toward the free shipping offer. Shipping charges may apply. The initiative of Total Member Involvement follows the commission of Jesus so that each believer "goes to the whole world ..."
More than simply a call to serve, this book presents simple and practical ways for each member to enlist as a worker for God, whether it is on the other side of the ocean or on the other side of the street. Join the beloved pastor and evangelist Alejandro Bullón, in urging each member to commit wholeheartedly with their personal participation in this global movement that will lead to the soon return of Christ. Philip Kotler, Ph.D., Norman Shawchuck, Ph.D., Bruce Wrenn, Ph.D.
Alejandro Bullon was born in Peru, and has worked for more than forty years in South America. 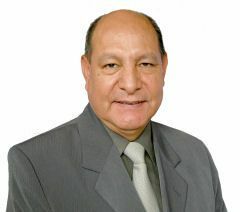 At present he lives in Brazil, and his greatest passion is public evangelism and communicating the gospel by radio, television, and the Internet. Tens of thousands of people attend his public conferences, and millions have benefited from his ministry. He is also the author of several books and articles. His works have been published in Spanish, Portuguese, and English.